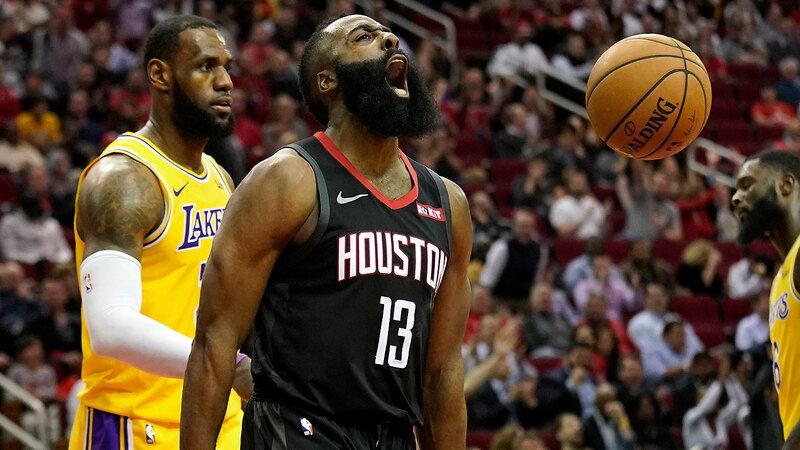 Harden recorded a 50-point triple-double and came through during a decisive stretch in the fourth quarter to lift the Rockets to a 126-111 NBA victory over the Lakers. Harden is one of just six players in NBA history to have recorded a 50-point triple-double, with Westbrook, Kareem Abdul-Jabbar, Elgin Baylor and Wilt Chamberlain the other players to have recorded multiple 50-point triple-doubles. The 2017-18 MVP capped off his performance with a clutch three-pointer over LeBron James late in the fourth quarter to effectively put away the Lakers for good. James finished with 29 points for the Lakers, who had won their previous two games. Houston's lead was three after Kyle Kuzma's soaring dunk but Harden was fouled on a three-pointer and made all three free throws to make it 112-106. Harden then made three-pointers on consecutive possessions to push the lead to 12 and cause Lakers coach Luke Walton to call a timeout. James added a dunk before Clint Capela and Harden made consecutive baskets to compete the 13-2 run and make it 122-108 to put the game out of reach.